Supermarkets are full of amazing finds which make saving money on groceries a tough challenge to many of us. However, saving on groceries is not as hard as we think it is! You might think scavenging on coupons or compromising the quality of your goods is the only way to cut off our expenses but there are, in fact, a lot of tips and tricks that we can easily apply in our grocery shopping routine. 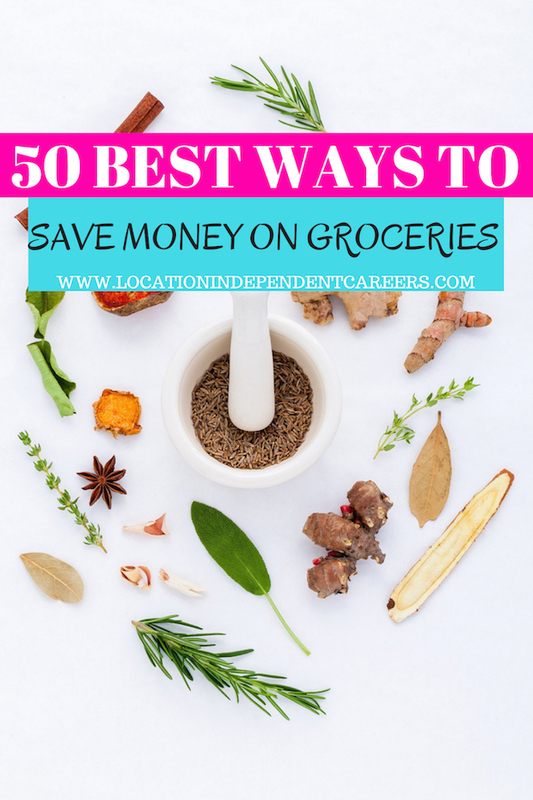 With that, here are 50 best ways to save money on groceries that you can do if you are in a budget. Even when you’re already doing the grocery for all of your life, you should still take a shopping list with you. Making a shopping list will help you know which items should be prioritized. This will keep you from buying things that you don’t really need. It can also help save time in the store. In connection to making a shopping list, evaluating your finances will help you identify how much you can only spend on grocery items. This will give you cash to spend on other liabilities as well. Then when doing your grocery, stick to your budget. We just have to admit it… coupons are a life-saver too. Just make sure to spend them on items that you really need so you’ll be using them wisely. Loyalty cards could give you the best deals. You’ll get amazing discounts and custom shopping deals based on your shopping preference. If you’re frequently doing your grocery on a store which also offers amazing member perks, then go for it and sign up for a loyalty card. Foods in the fridge are usually forgotten easily until they go bad. So before making the next trip to the grocery store, make sure that you have consumed as much as you can to avoid wasting money. Buying in bulk is one of the smartest hacks that you can use when you’re trying to save money from your grocery expenses. Warehouses offer bulk items for cheap. Also, remember that it is not advisable to buy perishable items in bulk unless you can consume it in a timely manner. Going to the grocery weekly is definitely not a good idea. It’s very time-consuming and it will cost you extra bucks. Consider doing your grocery every 2 weeks and use the previous tip (buying in bulk) to pull off this one. You can find fresh and cheap goods in the farmers market. Aside from saving a few bucks in your grocery, you’re also helping the local farmers earn a living. If you have a spacious backyard, why not consider planting fruits and vegetables in it? It’s a nice hobby to start and in the long run, it can help you save on grocery too. You can also be sure that you’re eating fresh produce every time. If you don’t know which plants to grow, try planting salad leaves, radishes, onions, and tomatoes. These are easy to grow plants at home. Bringing the exact amount when buying your grocery will help you stick to your budget and not overspend. You can practice placing your grocery budget in a separate envelope and avoid pulling out extra cash from your wallet when shopping. If you’re not a cash person, you can still save money by using your credit card. Just be sure you’re getting a card which has cash back perks every time you buy groceries on the supermarket. Shopping when hungry can lead you to a shopping cart filled with unnecessary items because of your cravings. To avoid this grave mistake, make sure you eat before going out for the groceries. With this, you can also prevent side-trips to a food stall which can take time. Kids are adorable but when it comes to shopping for groceries, it is best to keep them off the chore. They love pulling out random snacks from the shelves and they can also pull you off from your grocery list. Fruits or vegetables that are in season are sold very cheap and in high quality. As much as possible, try to adjust your meal plan to include these in your recipe. With this trick, you will be able to save a lot compared to buying goods that are offseason. Be quick to know what are the available deals in the stores and plan your meals based on these sale items. A meal plan helps you identify the items you need to buy in the grocery to avoid waste. This will also help you strategically plan which ingredients to buy in bulk too. You will also lessen trips to the grocery store once you have all your ingredients planned out. This means making a dish from scratch and not just relying on pre-made or processed foods. Aside from the fact that these foods are not healthy, pre-made foods will also cost you more than cooking your own. There are a lot of recipes online that you can follow. This book from Amazon is also a good investment for starters. Check it out here. A price book will give you information which store has the lowest price on the item, what is the highest price for an item, and when the item will be on sale. This is one of the most effective and popular ways to track prices for budget shoppers. Dinners don’t always have to be fancy with steak and wine. Sometimes, having pancakes or eggs for dinner is also a good idea. Aside from that, they’re easy to prepare. There are a lot of breakfast recipes out there that you can dig in on a lazy Thursday night. Instead of throwing them away immediately, place your leftovers in a food container and label it with the date. Then, make sure to utilize them the next day by reheating or creating a new dish out of it. There are stores that charge for a plastic bag. Bringing your own reusable bag will save you from these additional costs and it could also help save the environment. Check out this reusable shopping bag from Amazon. Do you want to receive more many saving ideas like this? Sign up to our mailing list to get prioritize access to our money saving and money making guides. At least consider a few meatless dishes in your monthly meal plan. We all know that meat is the most expensive item in every grocery list so save by using substitutes for meat once in a while like tofu or other vegetables. Clearance items are always in every store. These are items that the store has to dispose of quickly but are still in good condition. Keep an eye on these and check if an item that you need is for disposal. Impulse buying will always lead to unwise purchases. This is why making a shopping list and a meal plan are great ideas before hitting the store. One of the benefits of shopping in the same store is that you can already familiarize where you can find the items in your list. Knowing where to go in and out will keep you from bumping into unnecessary purchases along the way. This also helps save time. Stock up on sale items only when you’re using it regularly. Also, consider whether the item will easily perish or not. Buying sale items in bulk will save you a lot of cash. Most especially when the item is on sale, consider switching your regular brand to the one on sale. You don’t always have to stick to the usual product. Be a wise shopper and take advantage of sales. Generic items are cheaper but they are just the same as the branded ones. Don’t be afraid to try generic products. In the end, they will give you more savings than what you expected. Ran out of an ingredient? Search your entire kitchen for a substitute instead of going to the store to purchase. Be creative and swap ingredients like margarine instead of butter, light cream instead of evaporated milk, and mayonnaise instead of sour cream. This amazing Kitchen Hacks book will also give you more creative solutions to your common kitchen problems. Click here to get one. There might be a new store around the corner which offers cheaper grocery items than your usual store so be open to try new stores. Try looking at their ads or learn about it from colleagues or friends if you don’t have time to visit. There are stores that sell cheaper meat early in the morning. These are meat from the previous day (and doesn’t mean it has gone bad already) that the store wants to sell quickly before displaying fresh meats. During checkout, double check if the sale items are reflected correctly in the receipt. Sometimes, there are errors in the system where sale items are not discounted. Do a mental note on these sale items and inform the cashier for any errors. It may be a bit of a hassle but this extra step will save you big time. Don’t throw your receipts immediately. Sometimes, you can find a coupon at the back of a receipt and it would be a waste if you don’t check it first. Probably not known to all, stores usually place the most expensive items at eye level. Outsmart this smart trick by constantly checking the bottom and top shelves so you won’t fall for the priciest items. Disposable plates, cups, spoon, and fork will only cost you more. Buy the reusable version instead so you can still use it for the next time. You will not only save money but also the environment. For example, this reusable food wrap in Amazon will save you from constantly buying paper wraps for your sandwich and snacks. Always make sure that you only have enough space in your shopping cart for everything on your grocery list. Getting a bigger cart will only tempt you to fill the cart with extra items. You can also get this foldable grocery cart and roll it with you when you shop. If you live close by, you won’t also need to take a car or cab as carrying your groceries won’t be a problem. Therefore, saving you more money on gas or cab fare. Some stores allow double couponing while some don’t so be sure to ask around if double couponing is allowed. This will already give you twice the expected savings. Pre-sliced foods are more expensive than buying whole. Instead of spending extra on this, why not slice your own food instead? This goes for almost anything like fruits, cheese, chicken, pork, etc. Amazon has this ultimate vegetable slicer that will surely make your life in the kitchen easier. Get it here! If your store has a social media account– Facebook, Twitter, or Instagram, be sure to follow them to be updated of any surprise deals. Who doesn’t love cheese? Almost everyone loves cheese. Unfortunately, it is also one of the most expensive items in the grocery so as much as possible, try to minimize your cheese intake. Do this a few times a week and you’ll be able to save some bucks. Don’t buy goods that are about to expire! Check the expiration date first before checking out the item. This is one of the biggest mistakes we are not usually aware of that has to be corrected. It will be such a waste if you’re planning to consume it for the entire week but it’s already expiring in 2 days. A little research goes a long way. If you already have an expired good, check how long will it really take before it is no longer safe to consume. Sometimes, expiration dates only indicate a product’s peak freshness and is still safe to consume within a few days. Don’t immediately throw expired goods until you have verified if it’s already bad or not. Be sure that you know how to store your foods properly. For example, raw meat should be kept in a clean, sealed container at the bottom part of the fridge. Leftovers should be refrigerated as quickly as possible and must be consumed within 2-3 days. Foods inside tin cans must not be placed inside the fridge to avoid making it taste like metal. If you must, transfer it into a clean, sealed container like this Rubbermaid food storage container in Amazon. You can check the set here. If you have this benefit at work, you might want to include this in your budget planning. Free meals are such a great perk since it can help you save a lot in the groceries. If you’re working 5 times a day every week and you have free lunch in the office, then you wouldn’t have to worry about making a meal plan for lunch on these days. Be prepared for any last minute adjustments. Bringing a calculator while shopping will help keep you within the budget. You can let your kids help by asking them to add up the prices. Hopefully, this will be enough to keep them distracted while you focus on your list. There are a lot of free grocery apps that can help you list down your groceries, manage your budget and offer cash back. Some of the best apps in the market are Ibotta, Shopkick, Checkout 51, Grocery IQ, and GrocerEaze. Go ahead and check them out! If the sale item that you are looking for is already out of stock, don’t hesitate to ask for a rain check at the customer service. They’ll be happy to suggest a comparable item at the same sale price. If not, you can also come back when the item is already back in stock and still get the item at the sale price. If you’re still itching to buy offseason goods, getting them from the frozen section is a cheaper way. You’ll be surprised to see that some of these frozen goods are cheaper than their high-season price. Hiding foods is usually not a good idea because you’ll tend to forget that they exist until they expire. When storing foods, make sure that you store them in a safe location but still visible to everyone at home. When stocking foods, make sure that you’re consuming old stocks first. One way to practice this is to rotate your pantry. Every time you stock up food, be sure to keep the new ones at the back of the pile and move the old ones out– so you can use them. 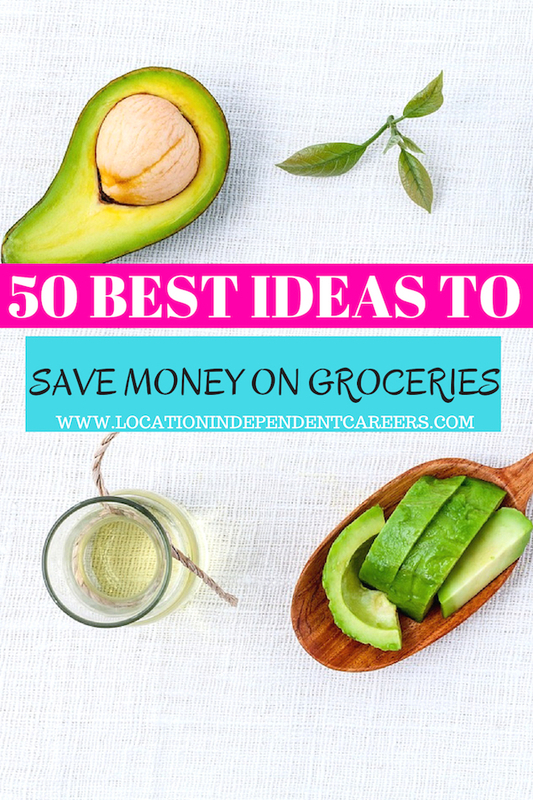 Want to find more ideas on how to save money on other stuff besides groceries? 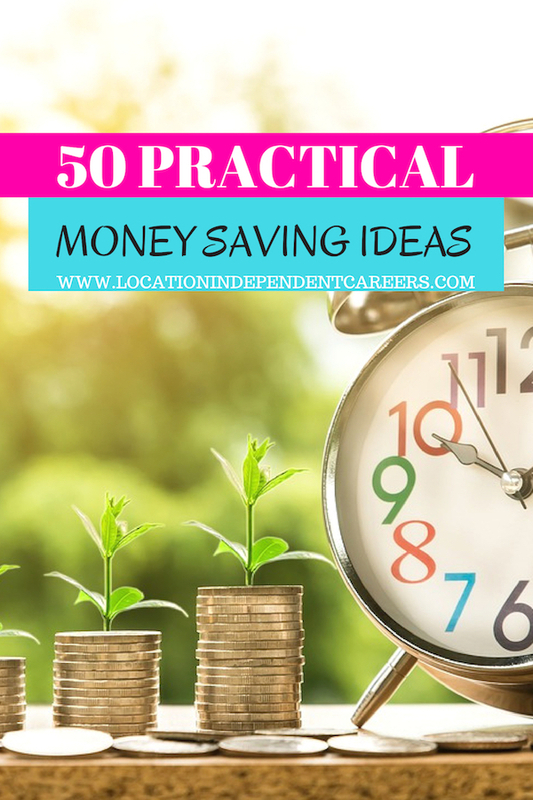 Check out our 50 Practical Money Saving Hacks. Let’s get it straight to the point… money makes the dream work and we all know that. It makes us capable of doing things we want, and to buy stuff we fancy. Until someone could invent the machine that automatically withdraws unlimited cash, saving money will always be in every adult’s guidebook to survival. 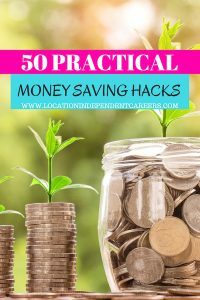 Lucky for you, we have listed out 50 practical money saving hacks that could save you until your next paycheck arrives. Impulsive buying is definitely one of the greatest factors for why we overspend. 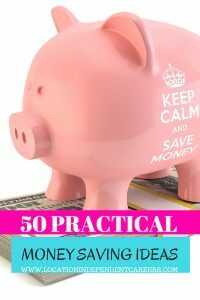 If you want to save yourself from splurging on unnecessary things, there is a popular mind-setting technique called the “30-day rule” where you wait for 30 days before coming back and buying the item. If you still feel excited when you see it after 30 days, then go for it! If not, then it’s a clear sign to pass. If you’re already doing the “30-day rule” but still getting the hang of it. Don’t worry… here’s another hack (and an easy one too) to keep you on track of your “Money Saving” journey. All you need is to make a simple shopping list. 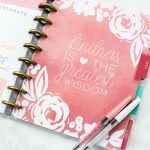 This will help you sort out your priorities and keep you in budget without getting tempted by these store eye-candies that you probably won’t use. Remember, the key to pulling this off successfully is to stick to your list. Ever thought of going through your old stuff and sorting out the trash for the garbage and trash for your pocket? Yep, this next money-saving hack encourages you to sell your used but unabused stuff that is most likely sleeping in your basement for almost a year now. You can do an annual inventory in your house and start looking for potential items that you can sell. This is one of the most practical life hacks for saving money and a good space saving hack at the same time. Smoking kills and it can also empty your pocket. In average, a pack of cigarette costs $6.28 but it could cost you more from the long-term health effect. So imagine how much you could save in a year if you minimize/ quit smoking? Aside from being eco-friendly, tumblers are a great way to save money. You can buy a tumbler for $20 and that’s still cheaper compared to your monthly cost for takeaway coffees. Start brewing your coffee at home and put it in your tumbler instead of spending for an overpriced coffee while at work. Another hack is to carry water in your tumbler instead of buying bottles of water everytime you feel thirsty. Be practical. If you’re already starting to make your shopping list, why don’t you try stepping up your game by buying things in bulk? Evaluate your list and note the items that you can buy in bulk such as paper goods, cleaning items (laundry detergent, etc), pet foods, and body lotion. Items with small shelf-life are definitely a No-No. 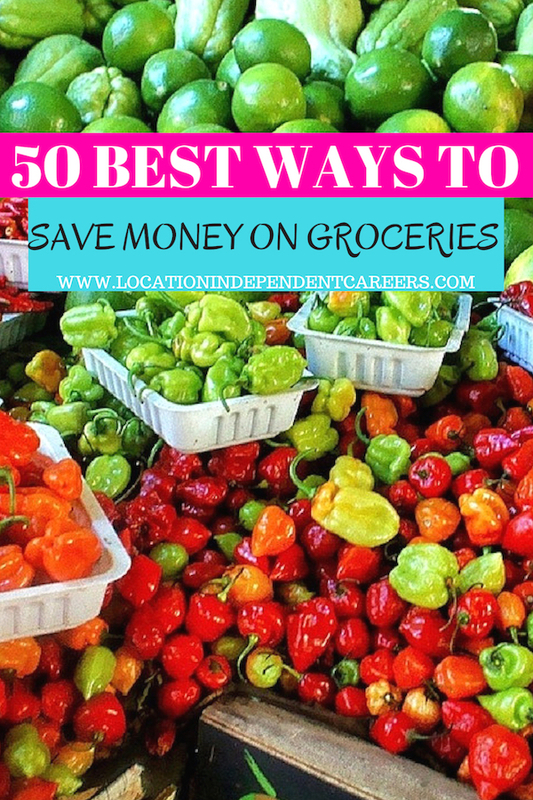 For more saving money on groceries ideas, click here. Buying lunch more or less cost $10 but that’s already $50 in a work-week. If you want to save a lot from your weekly expenses, making your own lunch is one of your practical options. Aside from saving money, you can also guarantee a clean, healthy, and delicious meal to stuff you up for the rest of the day. Shopping in thrift stores is fun most especially if you have an eye for vintage items. These goodies are insanely inexpensive in these shops than in other commercial stores. Also, you’ll find a lot of unique pieces so you won’t have to worry bumping into someone wearing the same top as yours. People who are moving out are usually starting the yard sales in your neighborhood and they always sell items they can’t bring for a very cheap price. 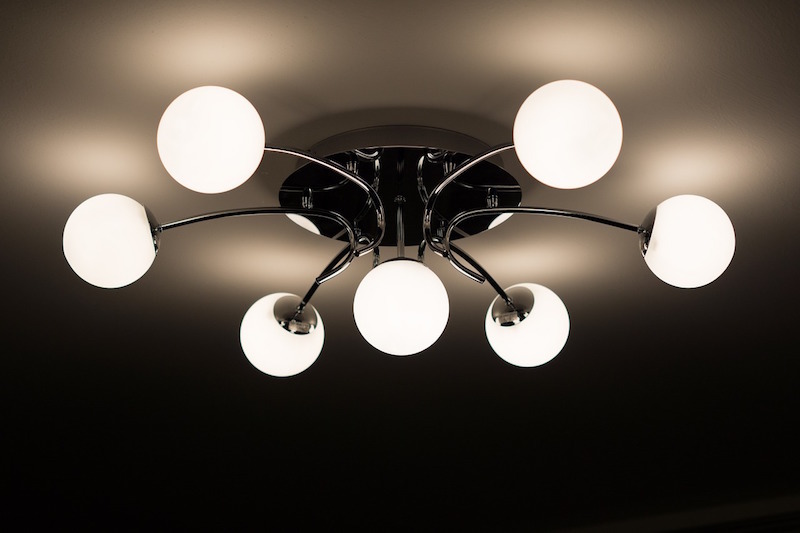 Aside from scouting for unused items at home, why don’t you start replacing your traditional bulbs with energy-efficient ones like the CFLs and LEDs? These type of bulbs may cost more than what you currently have but think of the long-term effect that it can give you. During the lifetime of these bulbs, they help save you money by using less energy. This $15 LED bulb from Amazon is worth a try. Adults want to get involved in everything as much as possible. This explains the handful membership cards we own but only one or two of these are actually active. Start by prioritizing which of these you really need. Paying membership fees for meaningless clubs will not, in any way, help you save money so better cut off ties with them as soon as possible. Don’t worry, you’re not the only one who has a fear of missing out. Once you’ve mastered the “30-days” rule, then it’s time to learn a similar technique, the “10-second“ rule. Whenever you desperately want to add an item to your shopping cart, give yourself 10 seconds to justify why you need to buy that item. If you can’t find a good reason, then leave it. Providing accommodation is a good business. If you have extra rooms at home, why not consider renting it out and make it useful? It’s a good hack to save money plus, it’s interesting to meet new people too! There are various platforms that can help you look for potential guests like Airbnb, HomeAway, FlipKey, and etc. Appearance makes a lasting impression but what if I tell you that you can dress to impress without stressing your wallet? All it takes is to master the art of minimalism. Start by purchasing clothes that you can mix and match easily. Check out these Basic women’s shirt and Cotton Pique Polo Shirt from Amazon. These timeless pieces will surely save you hundreds of bucks from clothes you can only wear once or twice a year. Unpleasant things sometimes happen unexpectedly like a ripped top or a broken cabinet door. At times like these, it helps if you know how to fix these small inconveniences yourself. This will help you save from repair fees and other expenses that come with it. Besides, there are already a bunch of online tutorials you can rely on these days. Some cell phone companies try to rip us off by adding unnecessary services that come with our phone plan. If you are budget conscious, try to check your cell phone bill and spot any services that you are not using. Then, ask the company to cancel your subscription to that service. Similar to the one above, evaluate if you’re getting the most of your cable bill. Are you tuning in to these channels regularly? If not, I think it’s time to cancel this service. We are usually tempted by these premium packages but we don’t really have the time to watch them. It’s a waste of money when there are other options online which allows you to pay what you only watch. Meat is delicious but it’s not completely healthy. On the other hand, it’s not cheap too. Save more money by minimizing the amount of meat you’re eating in a day or week and substitute it with a cheaper protein-rich food. It’s about time you start eating your fruits and vegetables! Be sure to get these assorted food storage containers to keep your veggies fresh. It may sound too much but there are actually companies who will generously grant your request. If the odds are in your favor, you’ll be able to save a big amount of money without sacrificing anything. Work your way to become a valuable client so you’ll get higher chances. It’s worth a try. Being employed gives us tons of perks but some of us don’t even know they exist. Familiarize yourself with your insurance package by knowing which services are covered by your company. This could range from a small doctor consultation to a serious medical operation. If not completely covered, at least you know how much the company is willing to pay instead of paying the whole fee from your pocket. If you’re planning to get your first car, remember that it’s okay if you don’t get the latest model. Aside from spending a lot on these expensive types, their value only depreciates as time pass by. You’ll only end up in great debt. On the other hand, consider second-hand cars that are still in perfect condition. There are some countries where going to the salon will cost them an arm… and probably a leg too. So instead of regularly going to a salon, why don’t you cut your own hair? This will save you a lot of money from regular salon visit when all you want to do is to trim your hair an inch shorter. For ladies, this is also a good hack if you don’t want to get tempted with the extra costs like a glittery mani and pedi. If you don’t have a garden yet, start one and grow edible plants to supply your kitchen. 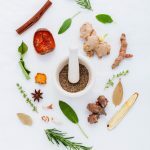 Some of these can also be used as skin-care so you can tell that you’re not only saving money from your kitchen supplies but also from your skin-care products. Amazon has a wide range of gardening tools. Check out this complete garden tools set. Prepared quite a bit too much for Christmas Eve? With a little bit of creativity and cooking skills, you can save money by spicing up your leftover foods and turning them into a new dish. This is a very practical money-saving hack that you can use rather than throwing foods in the trash. You know very well if you are an avid reader or not. If you have been keeping unread magazines in your house for some time now, then the answer is clear. You can call the magazine company and ask them to cancel your subscription. Besides, there are a lot of sources on the internet that you can turn to if you want to read about something. Visiting the library is also a good option for bookworms. The library offers free books you can borrow and read. Also, if you’re not confident if you can return it on time, hanging out in the library sounds like a perfect money saving plan than hanging out in the malls. If you’re using a washing machine, plan when you’re going to wash your clothes and always try to wash on full load. This technique is more energy efficient than washing small loads constantly in a week. If you live near the stations, taking public transport is a cheaper way than driving a car. It will save you the parking cost and fuel consumption. Not to mention the maintenance cost for replacing your oil and air filters, fixing flat tires, etc. Walking or biking is not a bad thing if you’re only heading a few blocks away. Instead of taking a short bus ride from home, why not travel by foot or bike? It is a healthy option not only for your body but also for your wallet. Technology is greatly involving nowadays and making landline phones unnecessary at home. Unlike landline phones, mobile phones can be carried around and you can get access to important messages as quickly as possible. Spending on maintenance is better than buying a new one more often. Do a maintenance check on your appliances and cars regularly so you can spot any problem before it becomes worse and costly. Aim to keep your things longer. Everyone goes weak for coupons and promotions so use it when it’s available. Plus, discounts could range from a few cents to half price. It’s definitely a great way to save money. The lottery is fun and exciting. It’s also cheap but not for a long time. Avoid the lottery as much as possible and stop fantasizing of that big win to solve your financial problems. Unless you’re made of luck… which probably is less likely. This might be a lot of work to do but it will serve you good in the long run. Try to compare prices from different stores. Check which shop is most likely to give regular discounts and promos too. Also, don’t forget to consider how much it will cost you to get there. Loyalty cards could give you exciting rewards in the future– which also means saving. Stores, nowadays, use this as a way to encourage buyers to buy from them. Aside from getting discounts, you’ll also know if there are any promotions ahead of time. Interest payments can be too difficult to pay most especially if the interest rate is too high and your source of income is merely enough. It’s like shaking the hands of the devil. If you have to deal with interest payments, opt for the lower ones. 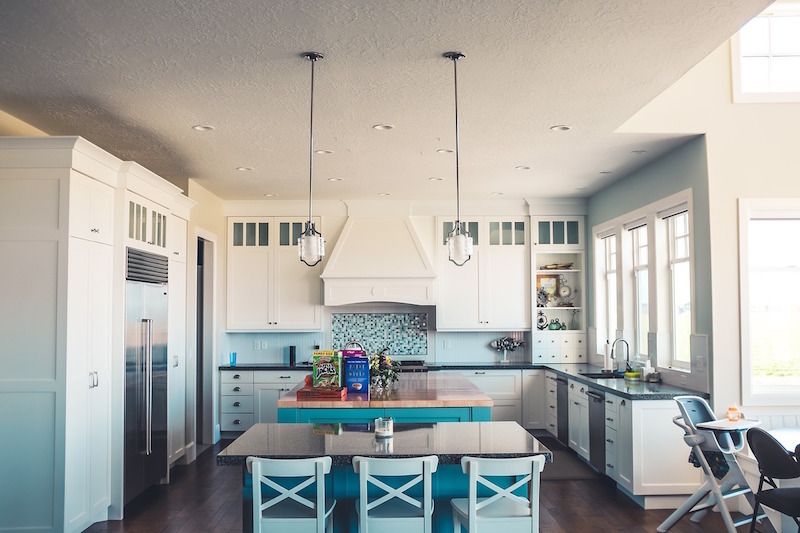 High-quality appliances are more expensive than substandard ones that are why a lot of homeowners get blinded by the fact that high-quality appliances actually help save money in the long run. With proper maintenance and usage, there’s a higher chance these appliances will last for 15 years. This Compact Twin Tub Washing Machine is a good option. You can check its price here. ATM fees are not that much but this little amount could sum up into something big. Avoid withdrawing money from ATMs charging a fee and be familiar which ATMs allow you to transact for free. Most importantly, know where to find them. When going out with friends, take advantage of the Happy Hour where drinks are usually half price lower or a large-sized drink for a price of a regular one. Rather than spending hours outdoor and store-hopping spend quality time in someone’s place where you can cook, watch movies, and drink. If not, why not offer your place? This will help you get rid of unnecessary expenses. Gather clean, used water from the shower and water your garden with it. You’re helping conserve water and save from your utility bill. Most of the time, generic brands are just the same ingredients as the branded ones except that they’re not… branded. They’re cheap and also effective. If you’re a mom, save yourself from expensive baby milk by breastfeeding your infant. It is healthy for your baby and it’s free! If you don’t feel comfortable breastfeeding in public, pump your milk on a baby bottle and carry it when you’re going out. Pumps vary in price so to check how much it costs, click here. Baby foods are expensive. Instead of buying ready to eat foods, why not make your own baby food? This can be as simple and healthy as a mashed avocado, apple, banana, etc. This $14 Baby Freezer Tray can help you make healthy and delicious treats. Water saving shower heads restrict the volume of water coming out of the shower thus, saving more water. Shower heads can be cheap like the Niagara Earth Massage showerhead which is one of Amazon’s best seller. The High Sierra Low Flow showerhead is also a good investment. Give it a try here. If weather permitting, prefer to hang clothes outside instead of using the dryer. Start by buying a clothes rack or setting up a clothesline in your backyard. Instead of buying new toys for your kids, join a group of parents who are up for a toy exchange event. This is a good way to get rid of old toys and get a new one for free. Another technique to make your clothes last longer and lower your energy bill is to wash your clothes in cold water instead of washing them in hot water. Besides, pretty sure most of your clothes don’t require to be washed in hot water. Keeping them plugged in will still draw energy even if they’re turned off. The best way to efficiently use this hack is to use a powerstrip and simple turn one button off for all. Make turning off lights a habit when leaving the room. 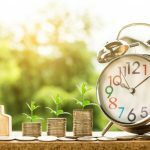 Even a step as simple as this can already help you save money. Most especially when going out for the few hours, be sure to check every room. If you can’t mentally track your expenses, write it down on a journal or on your phone. This way you can evaluate which activities you’re spending too much and make adjustments to your lifestyle. Small apartments make a cozy little home for starters. Equip it with the right furniture and you’re ready to call it your “Home sweet home”. If you’re new to this whole moving in and adulting stuff, rocking your small space might be quite a challenge. 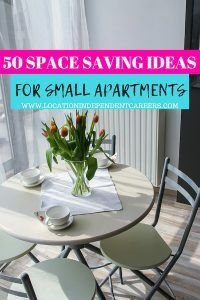 Good thing we all got you covered from A to Z with these 50 space saving ideas for small apartments. No one has time to buy a TV cabinet nowadays, besides, it’s just a total waste of space in your apartment. Mounting TVs to your living room wall will surely give you an extra space to breathe. Floor lamps surely add charm to your living room but it doesn’t mean they’re irreplaceable. You could start with the Luxrite LED Ceiling light, for example, or the contemporary chandelier from Kira Home. Both items can be purchased from Amazon and they make a good space-saving investment in your living room. You can buy more living room space with nesting tables. Use it as a decorative piece with a flower vase on top then pull out more tables when needed for your afternoon tea. Once done, get them back together and voila! This traditional 3-piece Nesting Table Set at Amazon is a very good purchase. Check here for its price. Having some guests for the weekend? A living room gives you the chance to show-off! If you have more stuff to display, stacking up shelves is a great hack to save space in your apartment. So, don’t be afraid to get this set of floating shelves from Greenco and fill it up with picture frames and cool trophies. It is cheap too! If you have stairs in your tiny apartment, why not utilize the space under? That’s right, Potterhead! It’s time for the “cupboard under the stairs”. You can use this space to keep books or store your shoes in a neat and tidy way. Small space can be fixed by working with the visuals. 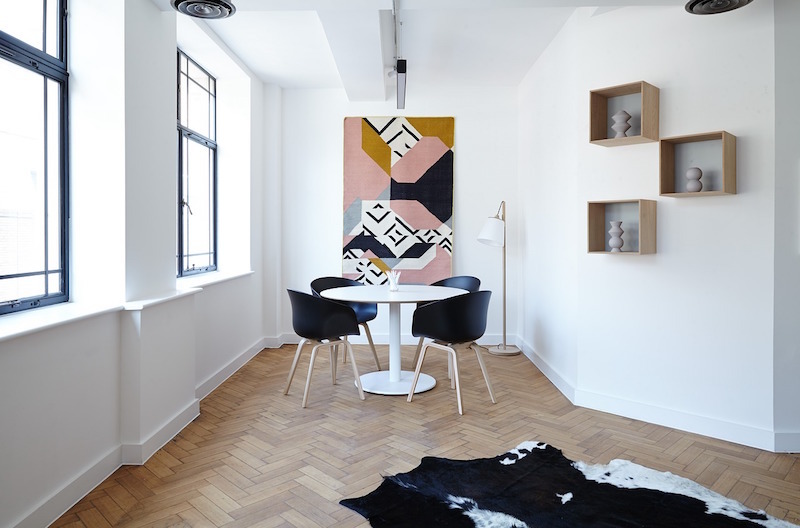 Instead of over-decorating your walls which will make the room look smaller, take the minimalist approach to make the room look spacious. Also, a couple of bigger wall art is better than a hundred small ones. A tight room can look lax and spacious with armless sofas. If you’re planning to bring in three comfortable sofas in your living room set, try getting armless on two of them to save a couple inches of space. Room dividers are the key to privacy but they’re easy to get rid of most especially for the space-conscious apartment owners. However, this large room divider from Ikea will surely make you want to take them back in and store books and other collectibles without regrets. A convertible sofa is a good space-saving hack because it can instantly turn into a bed. Now, you’ll have extra room for your guests. You also don’t have to store a big mattress somewhere and waste space. An ottoman with storage, like this, can store a few blankets, pillowcases, and magazines. Who will need an extra drawer for this? You can stick fridge magnets on the side but it would be more efficient to hang racks on it. A 6-tier fridge rack is a good choice for organizing jars, knives and kitchen gloves within reach. Get it here. The nasty place under your kitchen sink is also the safest place to keep your cleaning supplies and trash. Buy a two-level lady Susan to store your stuff and a small trash bin that fits under your sink. This will give you extra space in your kitchen. Running out of space for your casseroles and frying pans? A rack against your wall is also a great idea. Now, you don’t only have a space-saving solution but you also have a rocking eye-candy in your kitchen. If you don’t have space for shelves to store your goods, you can turn tight spaces into storage instead. Have a small space between your fridge and the wall? A slim rolling cart would fit perfectly in it. This 3-tier slim cart is one of the most popular of its kind and it’s ready to roll out spices, canned foods, and kitchen supplies without sacrificing space. A double-bowl sink is too much for a small kitchen space so opt for a single-bowl sink instead. There are a variety of sink styles and pretty sure you can easily find a single-bowl that will still look big. You might be looking for something like this Undermount Kitchen Sink by Kraus. A magnetic knife strip against a wall is a total killer. Not only will it save space in your kitchen but it will totally make the room look cool as ever. Knives with wooden handles usually look good for display so if you happen to have this set of knives, go on and put them in your magnetic strip. 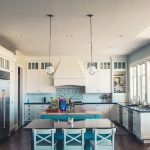 The space above your kitchen counters can usually be ignored but not when you have a tight space. Installing rows of kitchen shelves on the wall above it is one of the most practical ways to utilize this unused space. By using S hooks and bars, you can turn the sides of your kitchen cabinet usable. You can now hang towels, baking gloves, and aprons in one location. 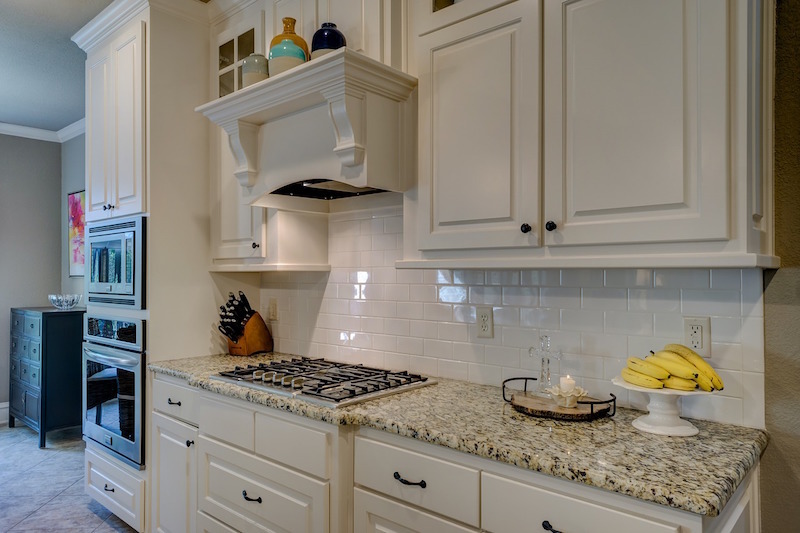 Bulky knobs can cause discomfort in a small kitchen. It is where accidents like bumping into bulky knobs and getting caught by the handles most likely happen. To avoid this, keep your kitchen hardware as minimalist as possible. Don’t get too many kitchen counters, instead, use over-the-sink items like a cutting board to prepare your dishes. A bamboo cutting board with adjustable legs can expand your kitchen space as it provides you with a sturdy workplace for cutting, mincing, or chopping. Check out its price on Amazon. A fold-down kitchen table gives you extra space for your things when you need it and an extra space for your kitchen when you don’t. Simply fold it and tuck it against the wall after using it. You can paint the bottom side of the table to make it look like a wall art when unused. A dining table with tuck-in seats should also make it to your dining area. This set will give you extra room since you will be tucking-in those seats when not “in use”. A dining set as versatile as this table from Abington Lane will surely show you how it is done. A corner desk extending close to your bed will not only serve as your workstation during daytime but it can act as a nightstand for bedtime too. Make sure to get a corner desk with drawers so you also have space to keep other things. If you have a spacious windowsill, bet you don’t need a dual-purpose corner desk because you can still save space by using the windowsill as a nightstand. Go ahead and place your bed by the window and place your usual nightstand items on top. Get a wall-mounted bedside lamp like this Kenroy Home Swing Arm Wall Lamp and you don’t have to get a bedside table for it. It will give space for other things that you need to keep within reach. 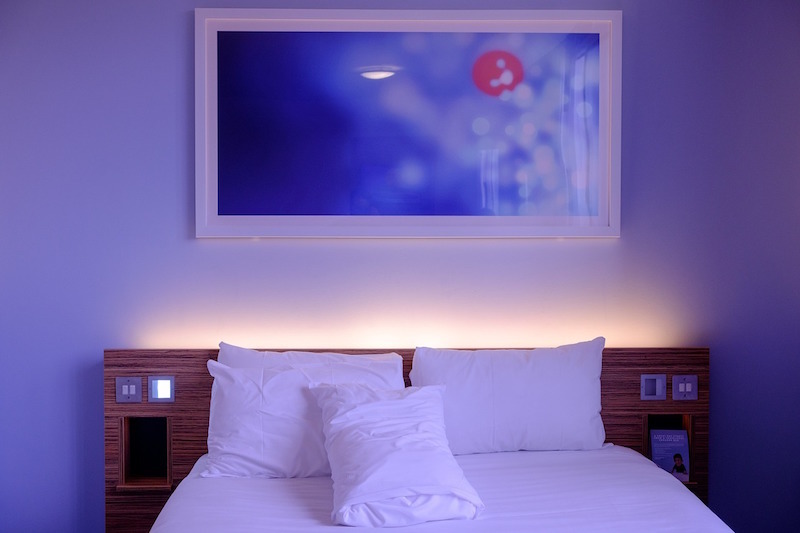 One way to keep you from getting floor lamps is to install lights on your headboard. This will also give your bedroom a fancy hotel vibe while saving space. Plus, you can reach for the switch easily. Neatly store your clothes, bags, and other items under your bed by getting something with a built-in storage. This bed with 6 drawers from Prepac is a good example. Check it out here. A built-in shelf is better than protruding shelves in your bedroom. 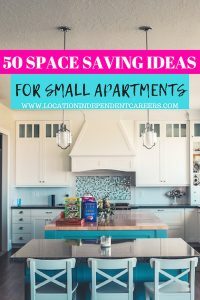 This will help you save space better. You can keep your personal stuff and papers without worrying about space. Save a few inches by skipping the headboard. Besides, it’s unnecessary for a small bedroom. Push your bed vertically against the wall instead and use the wall as a headboard. Another technique to save space is to use your window as the headboard. If you’re planning to mount shelves or other pieces on your wall and you don’t have enough for your bed, the window is an alternate solution. Cover it up with a nice curtain and you’re good to go. The space under your bathroom sink can be used to keep oversized bins with towels and bathrobes, or laundry. For a more stylish look, go for the woven basket ones. 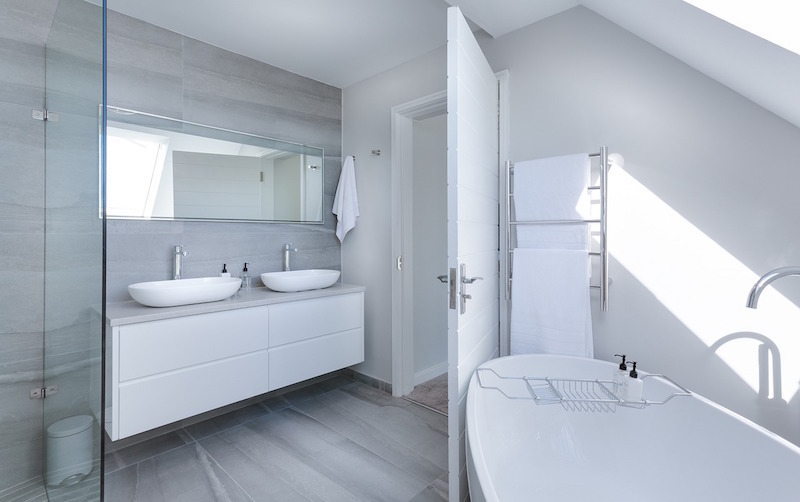 Mirrors and cabinets are two essential bathroom items but separately, these can take more space. This mirrored cabinet from Tangkula is wide and spacious enough to help you save space in your tiny bathroom. Simply mount it on your bathroom wall and it can be a mirror and a storage space at the same time. Compared to a rectangular sink, an oval sink leaves more space on top of your counter. It may not be that much but every inch matters when saving space. Wall space is also important and you can save it by using the wall above your tub and put towel racks on it. You can then hang your towels and grab them conveniently without getting off the tub. Another tip you can do is to place a large mirror over the tub. This will also make a good use of this wall— saving you lots of wall space and floor space. Rounded edges will free up a little bit of space in a tiny bathroom. They also reduce the chance of painfully bumping into hard edges. A sliding door saves more space than the traditional pull and push door. This is perfect for limited bathroom space so you don’t have to step back and rub shoulders with other items in your bathroom. Keep your toilet papers and sanitary items easily reachable with a toilet rack like the Bathroom Spacesaver rack from Zenna Home. It is perfect for every space-conscious homeowners who need a room for their bathroom necessities. This is a good place to keep your hair dryer, flat iron, and brushes. Just simply purchase an organizer and mount it behind the door of your bathroom cabinet. Your bathroom will surely look neat and organized all the time. If you have a low-rise bed, then it’s time to get a set of bed lifters to give more storage space underneath. These bed lifters will instantly give you extra storage space by simply putting them under each leg of your bed. 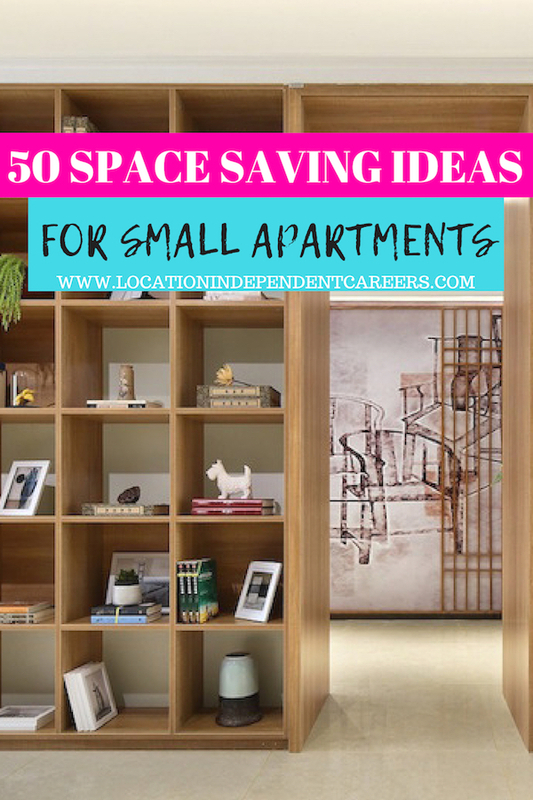 Get these space-savers here. If you don’t have space for a coffee table, an armrest table is a good alternative. Wrap it around your couch armrest, secure it, and enjoy a cup of coffee on it. You can also get a single couch coaster for your drinks if you don’t fancy a tray table. If you don’t need lots of items in your workspace, use a shelf instead of buying a new desk. This will save you money and space. For studio type apartments, you can also skip the room dividers and use your TV set to separate your bed space and entertainment space. Besides, you can also make sure you won’t have any distraction when it’s time for bed since the TV is facing the other side of the room. Opt for hanging clothes rack from the ceiling instead of buying bulky cabinets. You’ll be able to use your vertical space to give more floor room for other things. This adjustable hanging closet in Amazon is a good one. If living in a small studio-type apartment, consider building a loft bed. 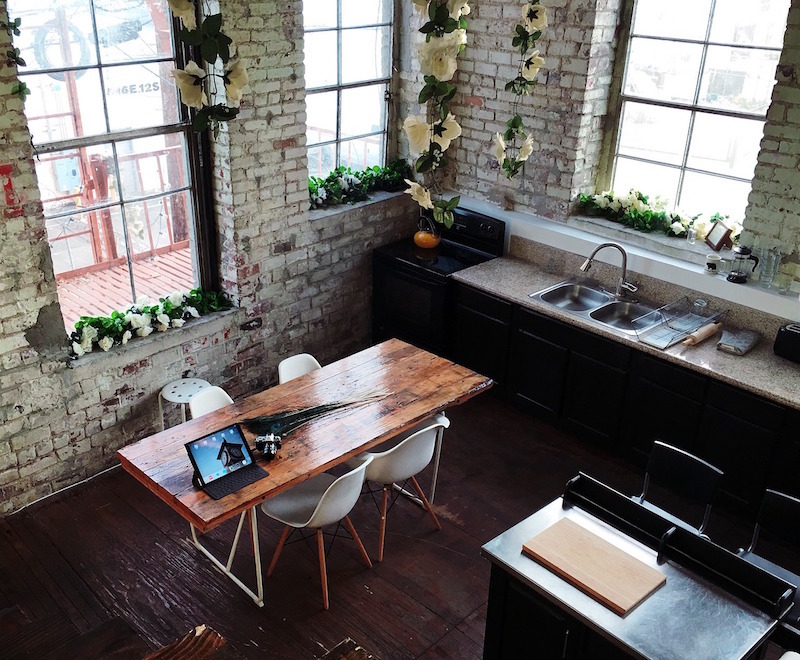 This room design is already very popular right now so why not give it a shot? Leaving in a small apartment needs the right mindset. Start by putting things back in their place instead of leaving things where you used them. This will be a challenge to some but it will be a very helpful space-saving habit in the long run. With a magnetic ironing mat, you can iron your clothes on any flat surface without any bulky ironing board so you don’t have to waste a space in your room. Go ahead and try this ironing mat from Houseables if you want to ditch your traditional ironing board. Your choice of colors will not literally expand your room but it somehow helps by bringing the illusion that it is. Neutral colors and sticking to a color scheme can make your small space look bigger. Also, try to bring more light in too. Installing a shelf above your door is also a good idea to utilize your space. You can keep extra towels, blankets, or even pillows on top. This hack is perfect for your bedroom or the bathroom. Location Independent Careers is your guide in finding online jobs or work from home jobs. We also provide life hacks and money saving ideas. All to help you survive the hustle of life.